Finaly after a long wait from april 28. My brand new intrepid 4x5 mk3 arrived. I ordered him as a mk2, but about 2 weeks before the end of the leadtime they started with the mk3. Can't wait to try him out. Congrats, Ron. Please post some thoughts regarding the camera once you've had a chance to use it. But when i wrote the post i thought to write he/she. But a nice detail. The wista is named after my last February passed away wife Marianne. It looks like a huge improvement on the Mark I, which I have. Please let us know how you get on with it. I see you have the pinhole. Will you be posting pinhole images too? A light camera is a plus, but it must still be rigid. Can you reassure us on this point? 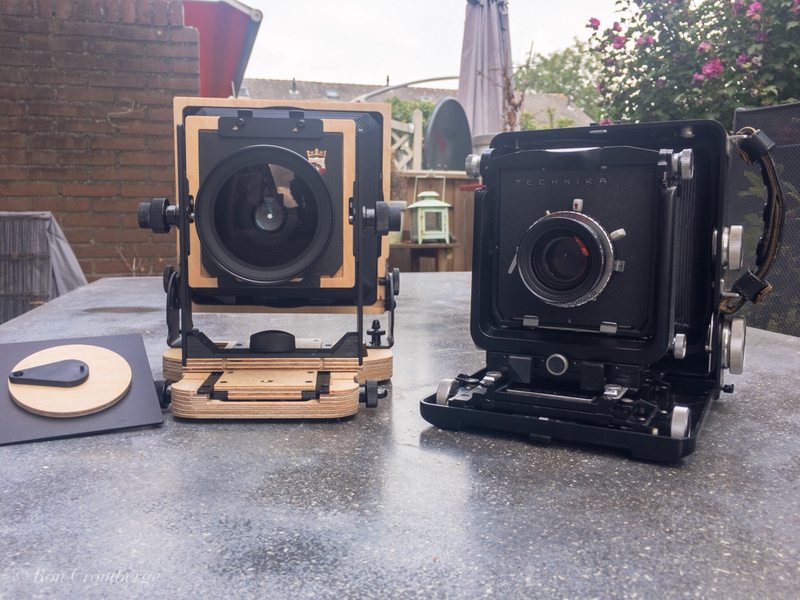 My 10x8, which closely resembles the 5x4 Mark II is quite rigid although the common lock for front rise and front tilt is a little tricky to manage with large lenses in Copal 3 shutters. Ron's Mark III seems to have overcome this problem. On the whole, I'm very pleased with it. Compared with my wista its not so rigid. So you must very carefully handle the knobs etc. But with all the knobs thigh its rigid. The weight difference of the two is almost 2 kg in the combo as showed on the photo. On the intrepid is a heavy 90mm 5.6 fujion attached. Yes, that's true. I should have mentioned that it's rigid when it's tightened down.